Conservation Law Foundation (CLF) has released a joint report, Understanding ISO New England’s Operational Fuel Security Analysis, which demonstrates that New England is already on track to ensure a reliable electric power system during even the coldest winters. According to a revised and corrected analysis by the ISO at the request of stakeholders, and contrary to its initial findings just a few months ago, there is virtually zero risk of rolling blackouts in the winter as long as the New England states continue to successfully invest in clean and renewable energy and energy efficiency on the pace required by existing state laws. ISO-NE has a long history of overestimating electricity demand growth and dramatically underestimating contributions from solar and energy efficiency. Chart below shows actual solar additions from Mass DOER versus ISO-NE projections for all of New England. 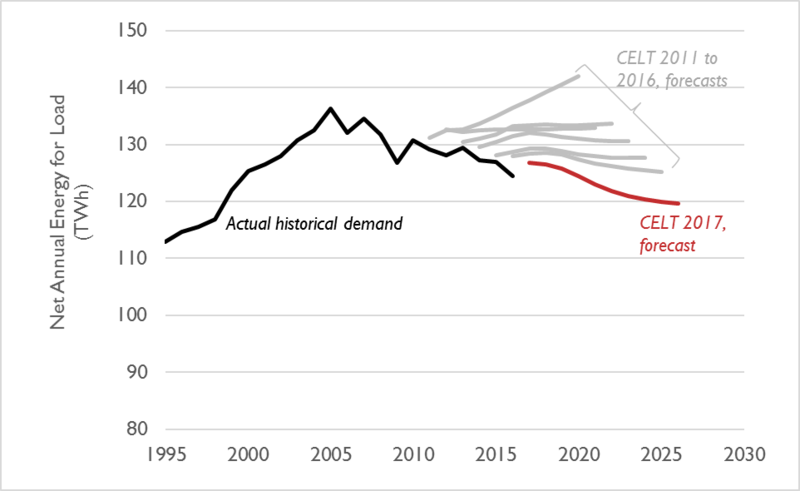 The CELT 2017 electricity consumption projection shown below assumes energy efficiency and solar contributions will decline by 50% over the next decade.